SOFTWARE professionals working in the IT industry will have to be more vigilent now. They could serve a life term in prison if their employers decide to prosecute them for stealing computer data. This is because a simple theft case too may get treated as a case of cyber terrorism under the amended cyber law, cleared by Parliament on December 25. It is awaiting the president's assent. The amended law--Information Technology (Amendment) Bill, 2008--does not clearly define cyber crimes that threaten the nation's security. So its provisions could be misused to implicate persons involved in less serious crimes like data theft, said software experts. The amendment says any person who, without authorization, accesses a computer resource to obtain restricted information that could benefit a group of individuals, is liable to be punished for cyber terrorism. Conviction under the law entails maximum punishment of a life term. Prabir Purakayastha, free and open source software activist, said the act is draconian and has no safeguards against misuse by government officials and IT companies. "If you are working for a company, you often take home data for work. The new law makes it possible for employers to punish you for this, if they so desire, and the offence is non-bailable," said Purakayastha. The new law, meant to curb cyber terrorism and give data security to government and private companies, also gives the government immense "powers of intrusion to access and block private e-mails and websites and decrypt coded messages," said Pavan Duggal, cyber law expert. The government has justified the urgency in passing the bill saying it was necessary to prevent stealing of high security data from government computers. "Safeguards would come later and they would be in line with the Supreme Court judgement on telephone tapping," said Gulshan Rai, of Department of information Technology (dit) who co-ordinated the drafting of the bill. He said the amended IT Act would increase confidence of foreign investors too. 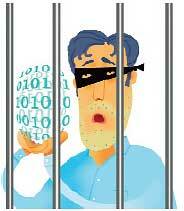 Software professionals said the new law does not curb terrorism but makes routine activities criminal.